Syn: Lipoma of the filum terminale, filar lipoma. 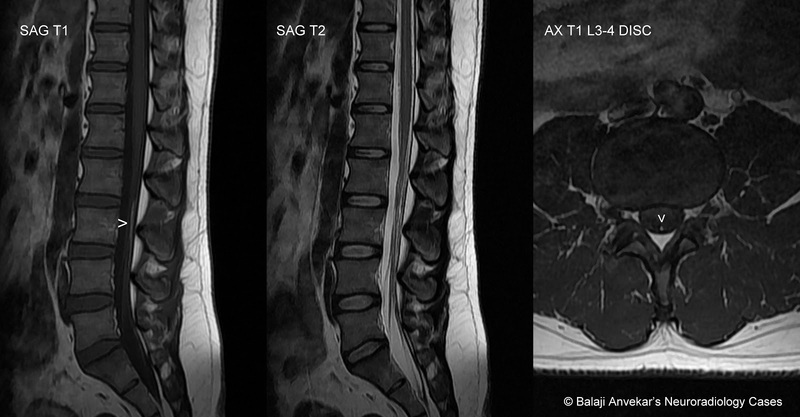 A relatively common benign finding on MR imaging of the lumbar spine, seen in ~ 5 % of cases. On MRI the abnormality typically is thin and linear, extends over only few segments. Signal iso intense to fat on all pulse sequences may show chemical shift artefact on T2* GRE sequences. T1 and T2 hyperintens with signal supression on STIR. In asymptomatic patients, nothing need be done. Difficulty arises in patients who have some symptoms suggesting tethered cord syndrome, but whose conus terminates at a normal level. Controversy as to the benefits of division of a fatty filum in such patients exists. Imagingwise there is little or no differential when signals of fat is confirmed, however other filum terminale lesions like paraganglioma of the filum terminale and myxopapillary ependymoma can be considered.